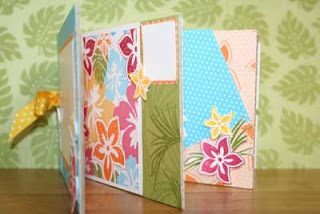 We created this fun, summer memory book in a teen class last week. I liked it so much I want to offer it as a kit for you to enjoy! · Cardboard used for “book” – there are 4 4x6 pieces. · Coordinating Inks (Old Olive, Rose Red, So Saffron): $5.95 ea. · Extra Cardboard for Additional Pages: $.10 ea. 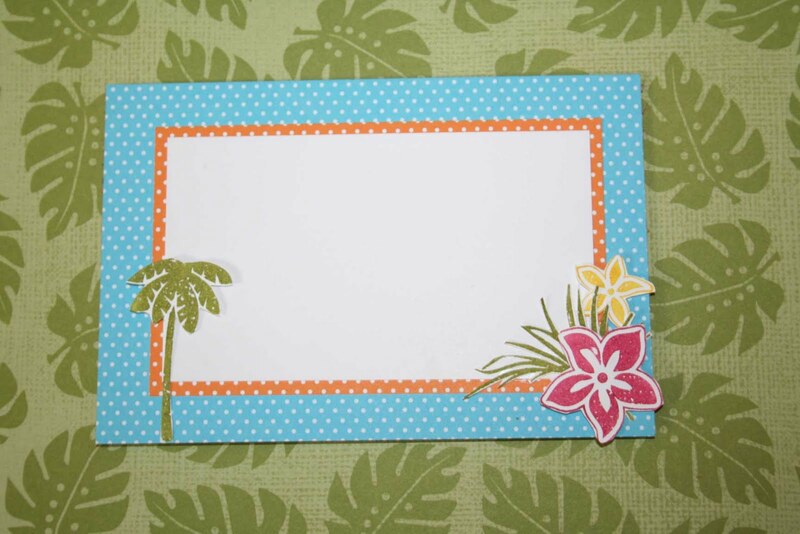 · **Extra Island Oasis Designer Series Paper; $9.95. · Whisper White (2 ¾ x 4 ¾). · Then the Pine Tree, Flowers, and Wisps were stamped on scrap paper and cut out (using Old Olive, Rose Red, So Saffron inks), and adhered using Stampin’ Dimensionals and SNAIL Adhesive. This is the 1st set of pages inside. Notice the striped paper on the left as the background and then two pieces of Pumpkin Pie polka dotted paper (2 ½ x 3 ½). Then the Oval Scallop Punch and Large Oval Punch were used to create the journaling oval in the middle (using Whisper White and Old Olive patterned paper). On the right, the background is the Old Olive background paper with the wisps, but then I stamped additional wisps in Old Olive. 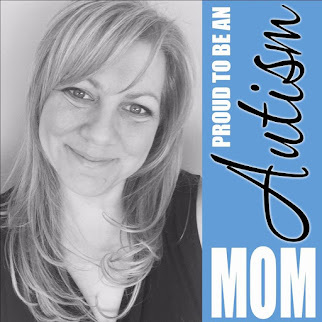 The center photo mat is 3 x 4 (Whisper White) and 2 ¾ x 3 ¾ (Hawaiian print). The two sets of square were created with square punches. Flowers were stamped on scrap and again cut out (Rose Red and So Saffron inks). Here is the 2nd set of inside pages, both with the floral, Pumpkin Pie pattened paper as the background. On the right, two 2 ½ inch square were used and placed diagonally. The center set of squares were again created with square punches. 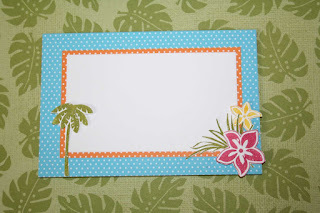 The palm tree was stamped on scrap and cut out, adhered with Stampin’ Dimenionals. On the right, there is just a 3x5 piece of Tempting Turquoise patterned paper, slanted (with the edges trimmed where it went over the edge of the board). Again the flowers and wisps were stamped on scrap, cut out, and adhered with SNAIL Adhesive and Stampin’ Dimensionals. The last pair of inside pages, one with the green background, the other with the striped background. On the left, again 2 sets of paper cut at 2 ½ x 3 ½, and then the Scallop Oval and Large Oval punches used in the center. On the right, 3 ½ x 5 ½ piece of Tempting Turquoise polka dotted paper was used. Again the palm tree was stamped on scrap and then adhered using Stampin’ Dimensionals. The back is not decorated but feel free to create your own design. 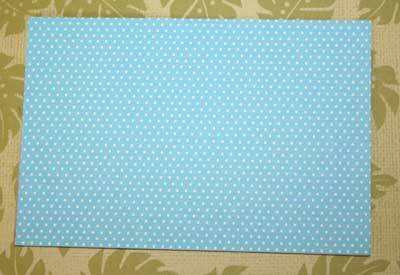 Here it is just a piece of Tempting Turquoise polka dotted paper covering the cardboard. Lastly, I used the Crop-a-Dile to punch one hole on the left of each page. Then tied a piece of ribbon through each hold and tied in a bow to serve as the “binding”. I really hope you making the project as much as I did!